After we arrived at the lake and the pilot was gone, we hauled our gear from the dock up to the cabin. None of us were expecting much, but it was better than we expected. There were six or eight single bunk beds in a back room. In the main room there was a picnic table, a few chairs, a wood stove heater, an LP gas refrigerator, an LP gas stove and a counter with some shelves. There wasn't much else except graffiti and the walls and ceiling were covered in it. The drive from north central Wisconsin took most of the night and we arrived in Sioux Lookout, Ontario about ten in the morning. 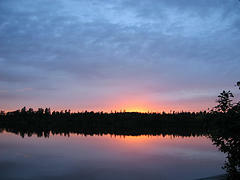 My dad had been to Sioux Lookout when he was about nineteen with some very close friends of his. We went to see the lake and the campsite where they spent a week, then it was on to the outfitter. not be overloaded. We hauled all our gear down to the dock and piled it up on the end. 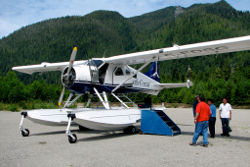 It wasn't long and plane arrived carrying the first load adventurers back from their vacation on a different remote lake. After filling up the gas tanks, the pilot began to load the plane with our gear.